Hairstyles with Maang tikka -One of the favorite pieces of hair accessories these days is the maang tikka, which is also known as the maatha, Patti. In the last post, we covered in detail what is maang tikka and how to wear maang tikka in different styles. It is a unique and beautiful piece of jewellery. Though it was traditionally considered a part of the bridal jewellery, now it can be worn at any traditional occasion by girls of all ages and face cuts. However, one of the most confusing and often asked question by girls is that what hairstyle should they make with their maang tikkas.So in this post, we’ll be addressing this common issue in a very simple way. I hope that by the end of this post, you will have enough knowledge to decide on the latest hairstyle with your maatha Patti. If you are planning on wearing the same maatha Patti for the second time, or wearing maatha patti for consecutive functions, these tips will help you create a new look every single time! If you have a nice long and wavy here, I believe the best option would be to go for open hair. You can use some mousse or other hair product to add volume to your hair if required. If you are using the maatha patti with a centre strand then obviously you will be parting your hair in the middle. 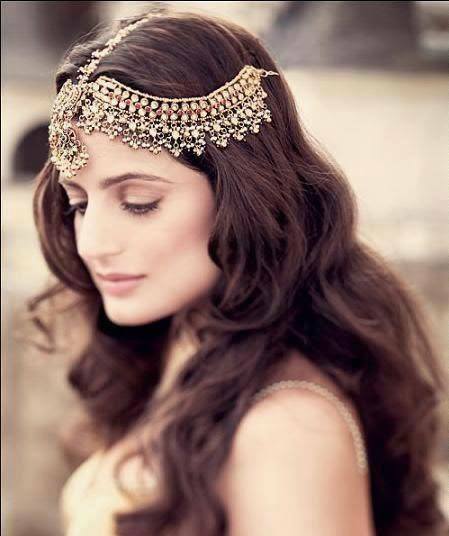 When such loose wavy curls are combined with a maatha patti, it creates a really soft, simple and yet attractive look. In case you have straight hair and want a similar effect then you can use a hair curler or even a straightening iron to create some loose and natural looking waves. This hair style is also specially recommended if you are wearing a heavy type of maatha patti or if you have long hair. Check out how stunning the Bollywood actresses Amisha Patel and Priyanka Chopra are looking in this hair style. Open hair looks especially amazing when you’re wearing your maathapatti with a nuth for a more traditional look. If you don’t want your all over your face but still want a similar effect as shown above, then you can go for high back combing and semi-tied hair. Again, this can be done with both straight as well as curled hair. This look was carried by Deepika at the 2014 Zee Cine awards. I would always recommend following Indian celebrities hairstyles with maang tikka as they always come up with stylish styles that you can copy. ↓ 14 – Maatha Patti with Straight hairs. In case you are wearing the simple pendant tikkas, then straight hair is surely the best option. The hair style is also ideal for a square and round shaped face as it helps cover up the face and create a slimmer look? Here are 18 New Maang Tikka Styles for Face Types. Whether you are the mehndi bride or attending a mehndi function, braids create the most beautiful and traditional look. In case of maang tikkas, you can go for simple braids as well as fishtail braids. They create a nice and soft look and are especially recommended for heart-shaped faces as they help enhance your jaw bone. In case you want to spice up your look you can also make the braid more attractive by using hair ornaments or flowers along with your maang tikka. You can also see here simple step by step tutorials to make braided hairstyles. With modern style or simple maathapattis like this one, a braided headband is an ideal choice. ↓ 10 – Maatha Patti With Buns. The bride or groom’s sister is one of the most busy person on any wedding event, which is why she wants a simple, no-fuss hairstyle. But at the same time, she also has to look her best which is why we recommend this simple look with maathapatti. The loose curls are simple enough and won’t require much work, while the polki maatha patti makes sure you look great. The look works best with a lehnga choli outfit and dewy makeup in pastel shades. Here are some 14 Best Summer Wedding Outfits for Mother of The Bride. For women in their 30s or 40s, this hairstyle is surely the best choice. The gorgeous Kareena Kapoor looks regal in maatha patti with her hair parted on one side. Have a look at these 20 Latest Style Indian Bridal Outfits. If you have some statement earrings to go with your maathapatti then you would want to go for swept back hair as they’ll allow your jewelry to truly shine. Here we see the beautiful Disha Patani acing a lehnga choli with the same hairstyle and a maang tikka. For semi-formal events or parties when you don’t want to look effortlessly chic, go for a messy bun with maatha patti. If you’re a fan of buns, do check out these 20 Cute Outfits with Top Bun Hairstyle to Compliment Style. Girls with hijab too can wear maathapattis, whether it’s for their big day or just for formal wear. This girl’s jodha akbar style maathapatti frames her hijab perfectly well to give her a glowing look. For more such ideas, check out these 17 Ways To Wear Hijab With Maatha Patti. Who can give better style inspiration than the style diva of Bollywood, Sonam Kapoor! She wears her maathapatti with chignon hairstyle, red lips and golden glittery eyeliner. Her dress is designed by the renowned Indian designer, Arpita Mehta. Here’s the same hairstyle with a maang tikka, instead of the maathapatti and some fresh flowers to freshen up the look. This is the simplest hairstyle for girls with short hair and it looks amazing when worn with a maathapatti. My face is short…and i m skinny.. which 1 looks good for my wedding???. .. it’s a south indian wedding. Crown Mang tikka is the latest trend for the brides to follow. Thanks for sharing these ideas with us. Keep up the good work.